Lumiglass Industries LLC has announced it will start offering architectural bullet resistant glass in view of rising demand amidst rampant construction in the region. The company, part of Glass LLC and a subsidiary of Dubai Investments, aims to reinforce its market presence in countries across the region, other Middle East countries and Asia and expand into new markets across the African continent. 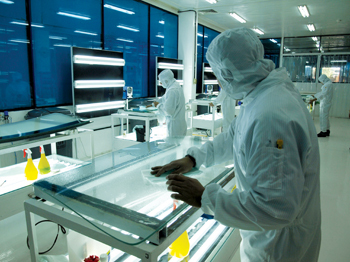 Lumiglass is currently operating in Egypt. 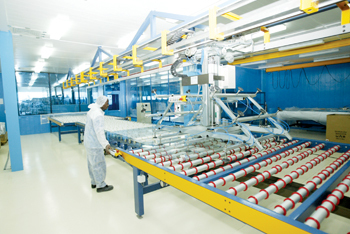 Glass LLC, meanwhile, announced that its coating lines comprising subsidiaries Emirates Glass LLC (EGL) and Saudi American Glass (SAG) have won projects exceeding Dh280 million ($76.2 million) in the first six months of 2015. The holding company is also tapping into new export markets for coated glass in the coming months, to complement its existing presence across the GCC and wider Mena region. The new markets include India, East Africa, South Africa and Turkey. “Glass is an inherent part of the construction industry in the region, and with over $4.3 trillion forecast to be spent on construction in Mena in the current decade, there is huge demand for cut-to-size, sustainable, post-temperable coated glass products for both commercial and residential projects,” it said. Lumiglass has already expanded its bullet-resistant glass production capacity by 50 per cent per year by adding new and advanced technology for automotive glass bending furnaces. The global bulletproof glass market has witnessed a massive growth trajectory in the past decade, and is expected to report a com-pounded annual growth rate of over 18 per cent in the period 2012-2016, driven by fast-paced growth in the automotive industry and expanding scope of usage in the construction sector. The company is studying plans to introduce new products in line with market demands, which include maximising the laminated safety glass offerings to meet the most complex safety and design requirements at various performance levels. Lumiglass Industries has successfully attained all relevant quality certifications such as the CE mark and label in accordance with EN 14449-2, as well as other internationally-recognised armour glass certifications for ballistic protection. Established in 2003, Lumiglass is one of the leading producers of safety and security laminated glass with wide automotive and ar-chitectural applications throughout the defence, security and construction industries. Investing in state-of-the-art technology and quality expertise to meet the highest codes of safety, Lumiglass Industries is a leader in the production of bullet resistant glass. The coating projects won by Emirates Glass and SAG came in the midst of an increase in the number of infrastructure contracts across the GCC. During the first half of 2015, new orders include multiple projects worth Dh150 million in the UAE, Dh75 million in Saudi Arabia, and Dh45 million in Qatar, Bahrain, Oman and Kuwait. Glass LLC subsidiaries also boast of strong order books for projects in the GCC, which include the 250,000 sq m of Solite-coated glass for ‘Akoya by Damac’ Apartments and Villas, 80,000 sq m of E-Lite Blue glass for Dubai Design Dis-trict, 40,000 sq m each for Viceroy Hotel in Dubai, Abdel Wahab Tower in Doha and Heart of Doha projects, 35,000 sq m for Worli Oberoi Hotel in Mumbai and 25,000 sq m for Warsan development in Dubai, among others.